/ Destin Sports Bar / Super Saturday Sports & Voted #1 PIZZA in Destin Florida! 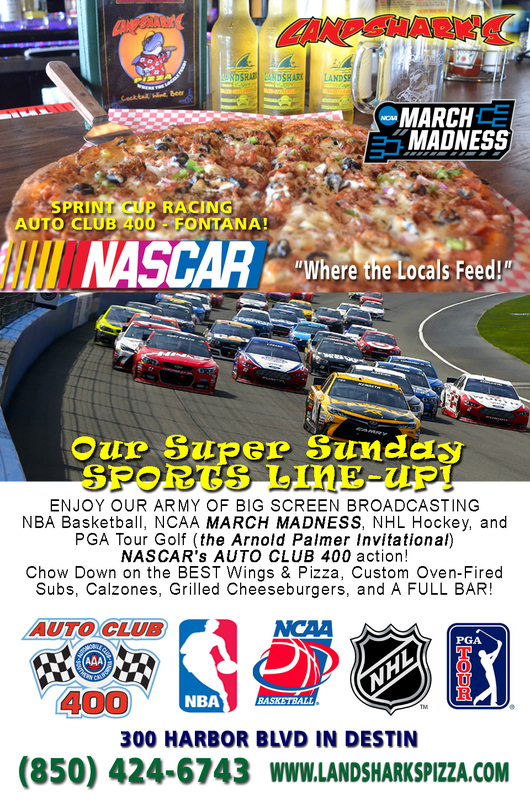 Super Saturday Sports & Voted #1 PIZZA in Destin Florida! 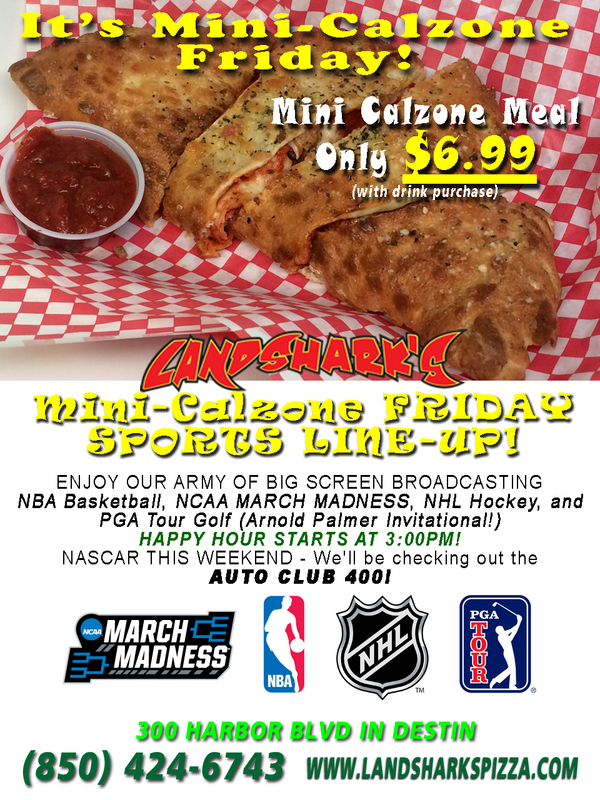 IT’S A SUPER SATURDAY SPORTS BONANZA AT LANDSHARK’S PIZZA COMPANY AT DESTIN HARBOR – VOTED THE BEST PIZZA IN DESTIN 2016! Jim Cantore here with your Landshark’s Weather Report – don’t mind the rain slicker and emergency rowboat I’m in – nothing’s gonna happen but a little rain later on and a tidal wave or two and maybe an earthquake just cuz I’m hanging around, but after that Harbor Pub Crawl a couple days ago you should be able to handle it easy. Besides, it’s just one more reason to hit the Harbor to enjoy some LANDSHARK’S! They’ve been voted THE BEST PIZZA IN DESTIN 2016 and that same level of love goes into their AWARD-WINNING HOT WINGS! Located in the heart of Destin, sporting a large menu ready for your immediate consumption – custom-built oven-baked subs, mouth-watering cheeseburgers grilled to your taste, appetizers galore, an army of big screen tv’s broadcasting NBA, NCAA, NHL, PGA, & NASCAR! 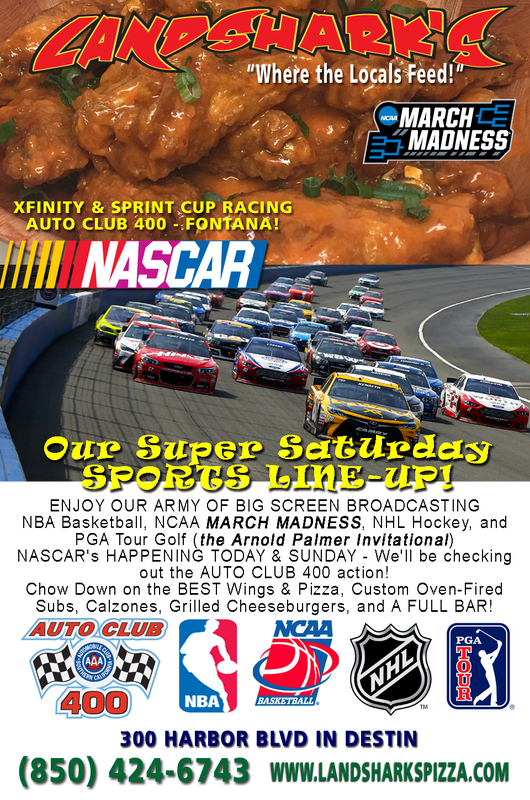 The ARNOLD PALMER INVITATIONAL Saturday round happens today as well as XFINITIY SERIES NASCAR at the AUTO CLUB 400 in Fontana (of course, the AUTO CLUB 400 SPRINT CUP RACE is tomorrow). MARCH MADNESS HAS TAKEN OVER! Some of you are already RIPPING UP YOUR BRACKETS – don’t despair. Just ask the owner Brian what he thinks and your brackets will shine! THEY’VE GOT A FULL BAR WAITING FOR YOU TO BELLY UP – A whole MENU of trailer-lifting category 5 beverages to blow you away. Sit outside and watch the world go by, or catch your team on the big screens and cheer with the rest of us! Previous Post: « $6.99 Post-Party FRIDAY MINI-CALZONE FEAST!